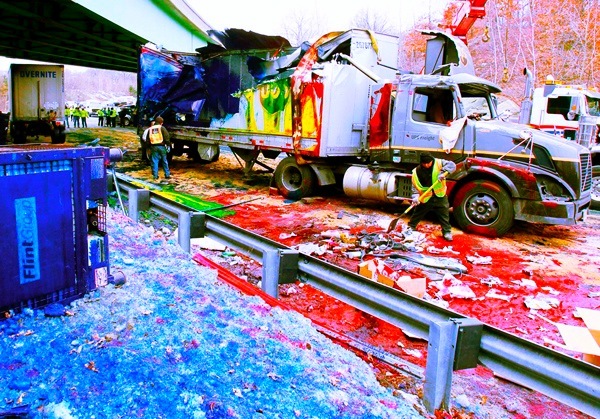 Boston residents got to see what 160,000 pounds of industrial printer ink looks like on a highway. Workers clean up the roadway after a tractor trailer carrying ink overturned on the ramp from 128 North to 95 North in Peabody. Source: Juxtapoz and Photo by Winslow Townson. Sometimes we just have to slow down and admire the beauty life throws at us, when we least expect it. This is pretty amazing! If only all road spills were as nice as this; on my way to London last month there was a butcher’s truck spillage blocking the motorway. That wasn’t as pretty. Wow Alex, what road was that on? Thanks!